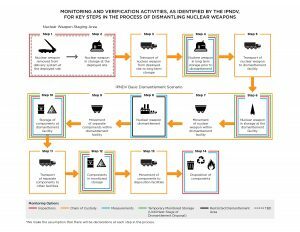 Deliverable 2: Assessment of Monitoring Objectives and Information Requirements for the "Basic Dismantlement Scenario"
What would it take to verify what happens during dismantlement? What are the objectives and requirements during these steps? In alignment with the objectives of IPNDV’s first phase, this deliverable from Working Group 1 is an assessment of the objectives and requirements for steps 6–10 of the 14-step dismantlement process. This paper provides a detailed assessment of the potential monitoring and verification requirements for the dismantlement of nuclear explosive devices (NEDs), including what information might be needed to satisfy those requirements, and an assessment of the kind of assurance that States would likely seek from verification.